Cupcakes from a bakery in Brooklyn - I didn't try them so am not sure how they were. 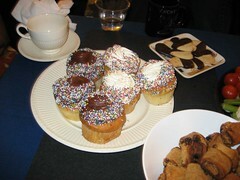 Yes, even cupcake bloggers sometimes don't want to eat cupcakes (the horror!). In fact, I eat them pretty rarely nowadays but I do buy them for people.